You see it on everything from T-shirts and hats to blogs and website sidebars, but what does KCCO mean? KCCO stands for "Keep Calm. Chive On." Not super cryptic, but it still deserves an explanation. 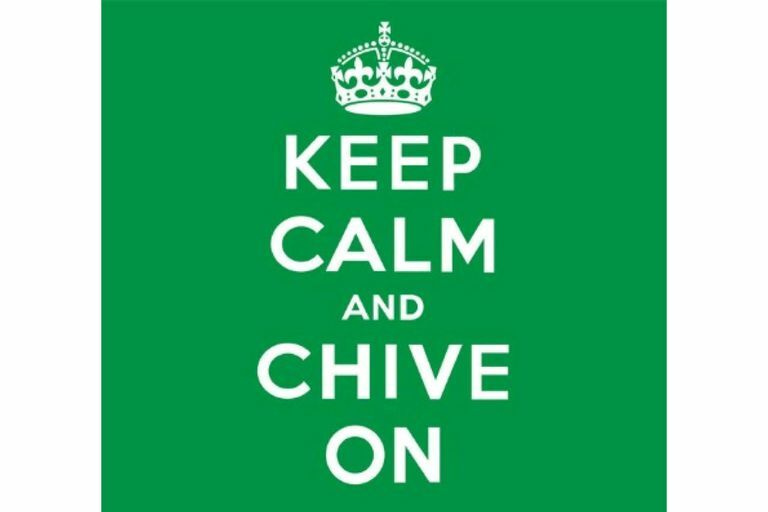 While the KCCO phrase originated with different wording during World War II, when the British government posted posters with "keep calm and carry on" to boost citizen morale after air attacks on England's cities, it has recently morphed into a modern pop culture reference revolving around the website theCHIVE. KCCO is now a modern slang expression in the same way Hang Loose, Be Cool, and Live and Let Live were popular in decades past. KCCO is a youthful and modern way to say, "Don't stress too much about life; just enjoy it." When you see the expression, it's supposed to invoke a good feeling. For example, if you're having a hard time at work, just keep calm and chive on. Remain at ease but keep pushing through. The same concept can be applied during literally any time of stress or overexcitement. TheCHIVE is a website full of photos, videos, and news links that highlights curious news and bizarre stories around the world. It's also a venue for provocative photos and young people who want to showboat online. The curiosity and youthful appeal of theCHIVE has garnered a massive cult following on the internet, and millions of readers everywhere visit theCHIVE every day to get their daily dose of laughter and smiles. Warning: theCHIVE is not for everyone and definitely not for young children. However, open-minded teens and adults of all ages will enjoy the blog. The stories and bizarre human reports you can find there are mesmerizing, and the photos of bikini-clad women and muscular men are motivating for some readers. The storytelling and human experience that's shared at theCHIVE make it a resonant place for people to experience the world vicariously. Are There Other Websites Like TheCHIVE? Many popular blog sites offer bizarre news like KCCO. What Are Other Modern Expressions Like KCCO? The KCCO expression, like many other internet expressions, is part of the online conversation culture. There are lots of other common abbreviations and web jargon used online such as FLBP and DAR. Where Can I Buy KCCO Apparel? You can buy T-shirts, tank tops, outerwear, pants, long-sleeved shirts, swimwear, and headwear from theCHIVE's online store, The Chivery. While you can probably buy KCCO attire elsewhere, theCHIVE's website is the best place to get the newest options.